Although annual mean temperatures in Washington were ultimately only slightly above average, the 2013 weather was anything but normal. Below average temperatures in January and again from October to December served to balance out a very warm interim period. With the exception of the early December arctic blast, even the cold months were not as cool as they seemed. Late fall is the time of the year when surface temperatures are the least correlated to the temperatures of the overall air mass. Inversions during the January and October to December periods allowed the temperatures in the lowlands to remain cool, even when the air aloft was rather warm. 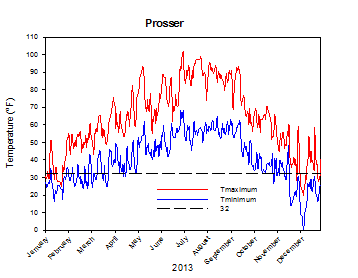 Interestingly, Prosser's warm season (April to September) temperatures were 1.7 degrees above average, and 2.4 degrees above average at night. 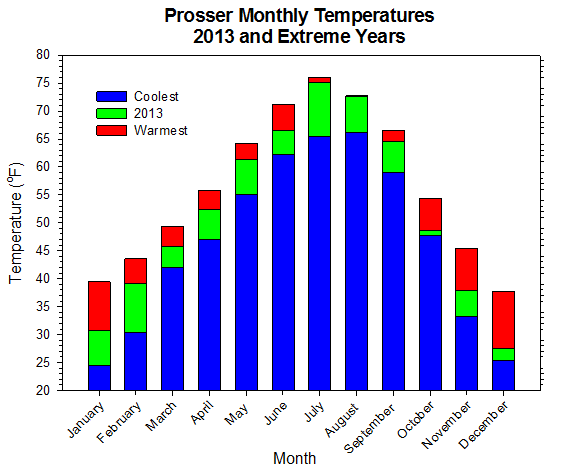 In fact, Prosser experienced several notable monthly climate occurrences last year, including the warmest monthly mean high temperature on record for any month (July, 92.1 degrees), the warmest monthly mean low temperatures on record in August and September, the warmest August since 1991, and the second warmest summer on record (1990 to present). 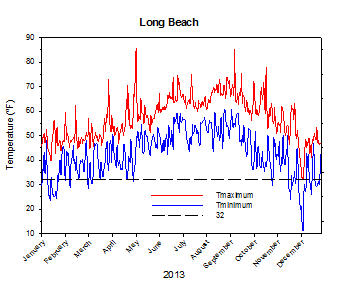 By contrast, the December mean low temperature was 7.2 degrees below average. 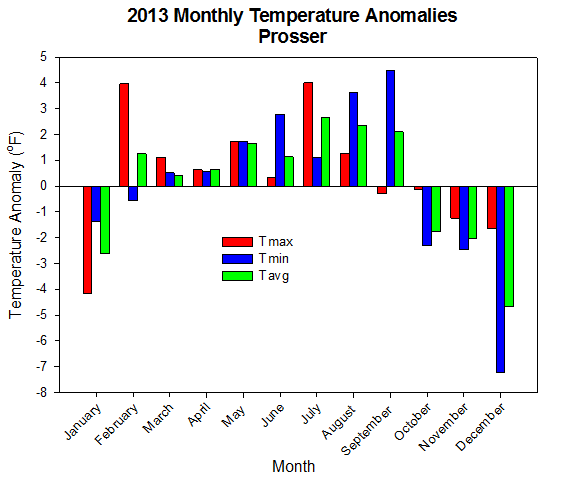 That is the largest (positive or negative) monthly temperature anomaly (high, mean, or low) since December 2009. The strange temperature distribution makes more sense when viewed through the prism of the overall weather pattern. The unusually clear and inactive weather pattern that persisted during much of 2013 translated into relatively warm conditions for much of the year. 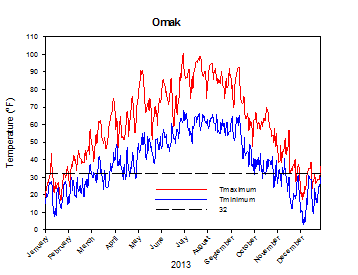 However, the opposite can be true in the cold season when inversions can be strong during dry periods. 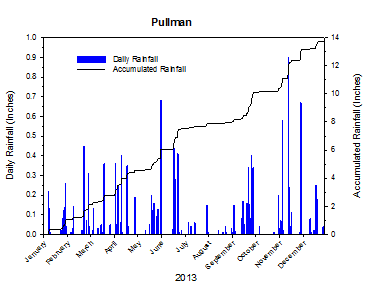 Even the seasonal distribution of eventful weather was somewhat inverted in 2013. Conditions were relatively dry and benign during the normally active and wet months like January/February and October to December. 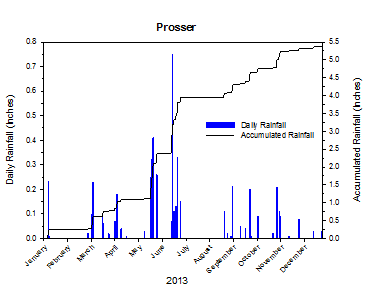 Meanwhile, most of the active weather occurred during unlikely times like August and September. 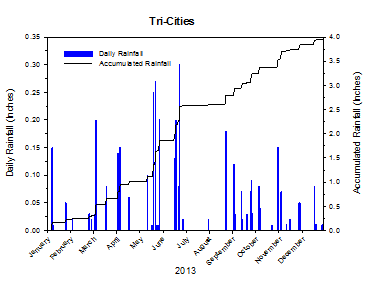 It is noteworthy that several west-side locations like Vancouver and Seattle, which experienced more precipitation (P) than ET (evapotranspiration) in 2012, recorded net negative (P - ET) values in 2013. 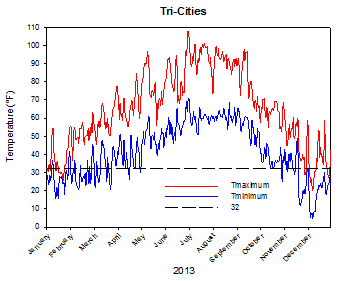 At Vancouver, (P - ET) was +7.53 in 2012, but only -12.24 in 2013. 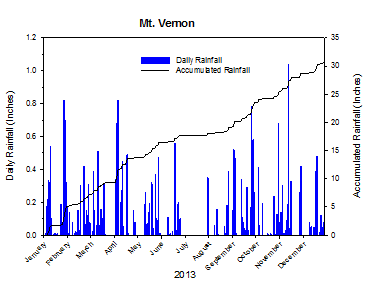 There were numerous significant meteorological events in 2013. An early May heat wave sent temperatures soaring into the 90s across eastern Washington, while cool and wet weather later in the month kept high temperatures at some of the same locations below 50 degrees on May 22nd. Another major heat wave on July 1st and 2nd sent temperatures east of the Cascades soaring into the 100s. Like its May predecessor, the July hot spell was the earliest heat wave of such magnitude since 1992. Otherwise, July was a hot and dry month, with record heat in the east and record dryness in the largely rain-free west. August, though not terribly wet, was unusually humid, which aided in the development of several episodes of thunderstorms. September was a warm and stormy month which began with periods of convective activity. On September 15th, a line of strong thunderstorms raged through central Washington, causing 60 mph winds and heavy rain squalls. The high temperature of 101 degrees at College Place was the latest occurrence in the history of AgWeatherNet of a 100-degree temperature. September ended with an epic 3-day storm that dropped more than 5 inches of rain at East Olympia, while also bringing heavy snow to the mountains, and winds of over 70 mph to Huntsville. Finally, an early December arctic outbreak was responsible for some of the coldest temperatures since late November of 2010. A stable ridge of high pressure dominated the weather for much of January, causing unusually dry and calm conditions. While the lowlands were cold, foggy, and stagnant, the mountains were generally sunny and mild. February was relatively uneventful, and temperatures were generally mild. Although the weather during March and April was variable, conditions remained unremarkable, and warmer than normal. Aside from the late season frost that greeted central Washington on the morning of May 1st, the rest of early May was characterized by sunshine and unusually early heat. However, much cooler and wetter weather later in the month resulted in May experiencing one of the most remarkable weather reversals in recent memory. Rarely does the pattern transition from record heat to record cold so quickly within one calendar month. 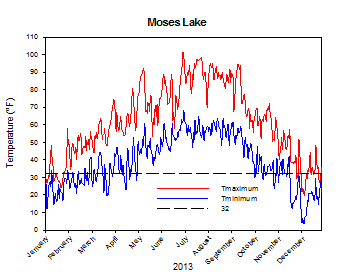 More amazing still was the fact that the rapid cooling strongly opposed the typical spring trend of warming with time. While Prosser's average high temperature from May 1st to 12th was 83.3 degrees, the average high during the period of May 20 to 31 was only 66.3 degrees, which is 17 degrees cooler! 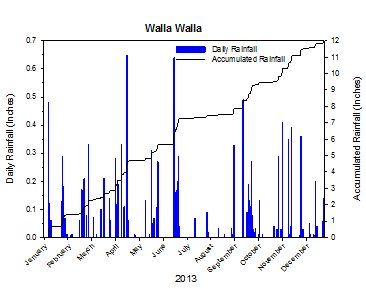 June was generally a warm month that featured some poorly timed rainfall in central Washington, which led to cherry cracking concerns. Yet another heat wave arrived on July 1st and 2nd, and brought the warmest weather in several years to eastern Washington. Temperatures were as warm as 108 degrees. 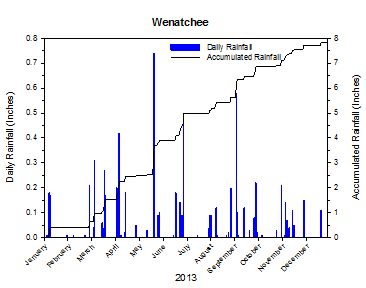 Overall, July was hot and dry across the state. August featured a few periods of stormy weather, along with record night-time warmth. September was an eventful month that featured both convective and synoptic scale storms. There were several episodes of thunderstorms early in the month. The final and most notable convective event occurred on September 15th, as a line of thunderstorms raced through Washington. Torrential rain, strong winds, and large hail accompanied the powerful storms. A winter-like storm system battered Washington from September 28th to 30th with strong wind, heavy rainfall, and significant mountain snowfall. East Olympia recorded nearly 3 inches of rain on the 28th alone, and the Cascade high country received more than one foot of snow, while winds at Huntsville gusted to 71 mph. By contrast, October and November were cool and uneventful. 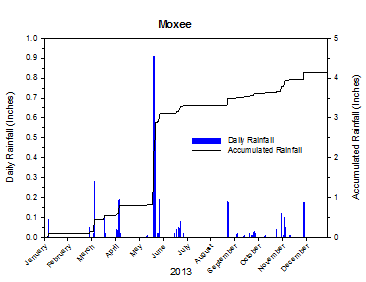 Most western sites were wetter in September than during October and November combined, while a few areas registered almost as much rain during the 3-day, late September superstorm as they received during the subsequent two months. The early December arctic outbreak highlighted an otherwise benign weather month. 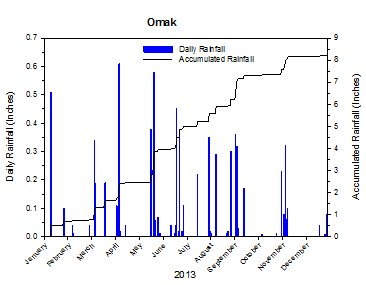 Overall, December was dry and cold, especially at night. 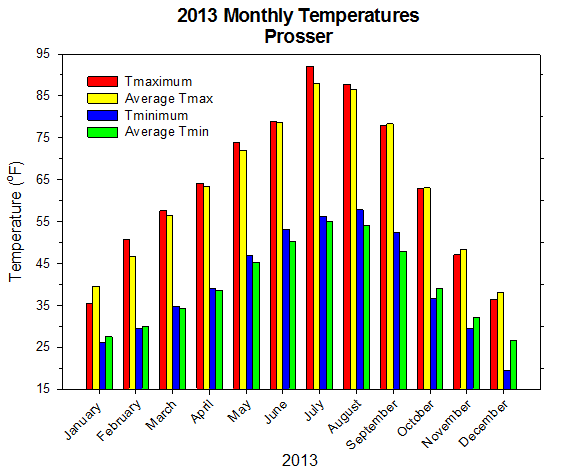 The 2013 average temperature at Prosser (WSU IAREC) was 51.9 degrees, which is 0.1 degrees above average. The average high temperature was 63.8 degrees, which is 0.5 degrees above average. The average low temperature was 40.2, which is 0.1 degrees above average. 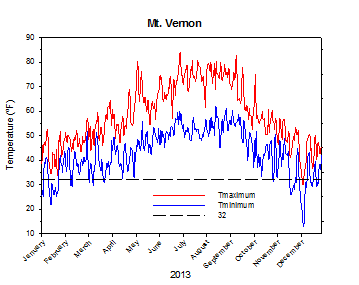 The average 8" soil temperature was 55.6 degrees. 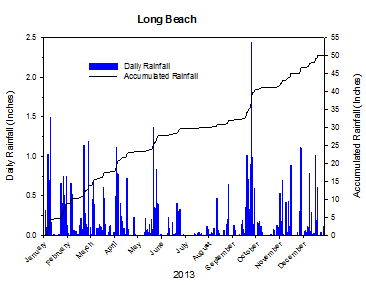 5.39 inches of precipitation fell during the year, and the average wind speed was 4.3 mph. The warmest temperature of the year was 102.0°F on July 2nd, while the coolest high was 19.7°F on December 8th. The warmest low temperature was 68.5°F on July 2nd, while the coldest temperature of the year was 0.6°F on December 8th. The warmest day of the year was July 2nd, with an average temperature of 85.3°F, while the coldest day of the year was December 8th at 9.3°F. The coldest month of the year was December, with an average of 27.5°F, while the warmest month of the year was July, with an average of 75.1°F. 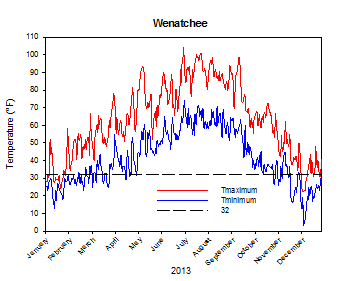 The average 2013 high and low temperatures at Wenatchee were 63.4°F and 41.4°F. March 31st: The temperature at the Tri-Cities soared to 76 degrees. May 10th: The temperature at Hundred Circles reached 97 degrees. July 1st: The temperature at Benton City peaked at 108 degrees. September 15th: The temperature at College Place climbed to 101 degrees. September 15th: More than 1 inch of rain fell at Wheeler in only 15 minutes during a thunderstorm. September 28th: The wind at Huntsville gusted to over 71 mph. December 1st: More than 6 inches of rain fell at Stevenson. 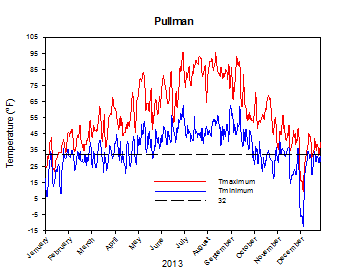 December 8th: The temperature at Pullman plunged to -12 degrees. January: Stagnant and cold in the lowlands. June: Warm, especially at night. 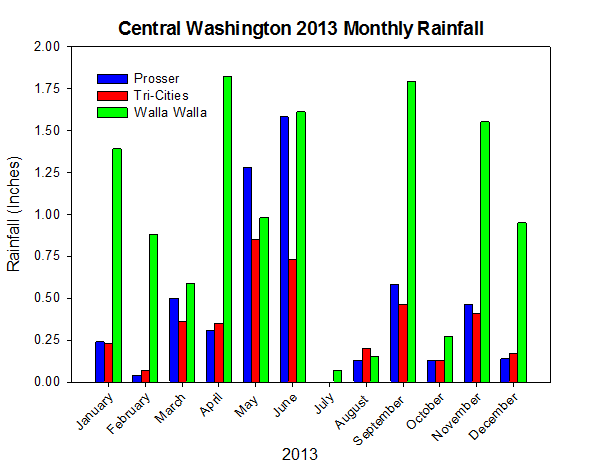 2013 was generally a favorable year for Washington agriculture. The apple crop was large and of good quality. 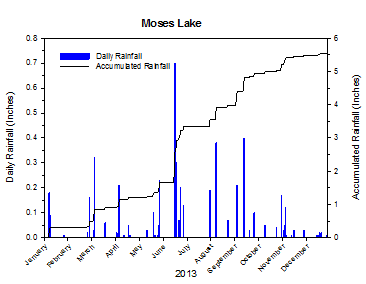 However, several notable weather events with agricultural significance occurred in 2013. A line of strong thunderstorms moved through the lower Columbia Basin on September 15th, and caused appreciable crop damage in certain areas. Powerful winds flattened some Franklin County corn fields, while also blowing apples off of trees. In some instances, the wind was accompanied by heavy rainfall and large hail. 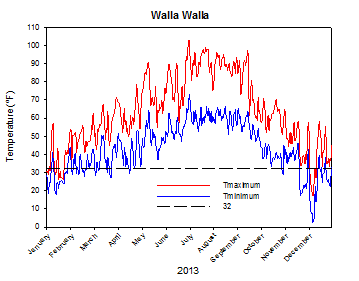 Poorly timed rainfall in central Washington in late June was bad news for cherry growers, although the primary concerns for most of the summer were sun scald and heat stress prevention. The potential cherry crop yield was diminished early in the season by windy and unfavorable pollination conditions during mid April. Overall, accumulated Growing Degree Day (GDD) values were generally well above average at the end of the growing season (National Agricultural Statistics Service). 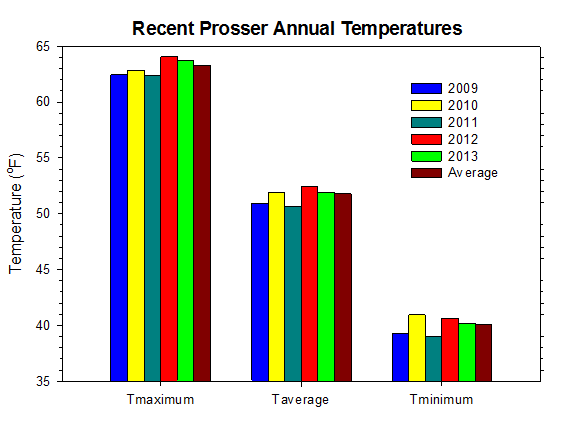 Prosser's annual mean temperature in 1993 was only 49.4 degrees, which is 2.4 degrees, or 2.2 standard deviations below the 1990 to 2013 average. In fact, there has only been one other year since at least 1990 when the annual mean temperature was below 50 degrees (1996; 49.9 degrees). According to the Climate Prediction Center, average weather conditions are favored during the late winter and into the spring season, with above normal temperatures becoming likely by summer. 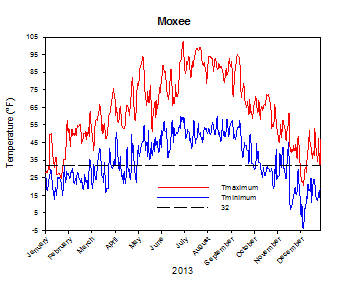 ENSO Neutral conditions are expected to become El Niño conditions during the summer as well.